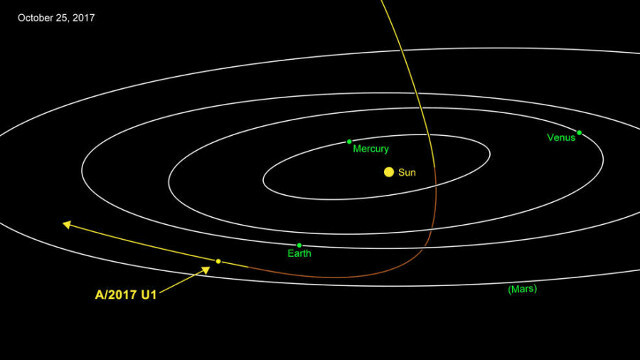 The announcement of the discovery of a possible asteroid coming from another solar system is a big deal. Named as A/2017 U1, it was detected on October 19 by the Pan-STARRS 1 telescope in Hawaii, part of a sky observation system normally used to detect celestial bodies of various kinds. Its motion seems incompatible with the trajectories of asteroids and comets gravitationally bound to the Sun so it could be the first celestial body discovered that came from another star, perhaps Vega. Rob Weryk of the University of Hawaii Institute for Astronomy (IfA) discovered A/2017 U1 on October 19 during routine nightly observations looking for NEOs (Near-Earth Objects) in collaboration with NASA. A check in the observation archive revealed that it was already present in the images of the previous night but wasn’t identified by the automatic system. In such cases, other telescopes quickly involved, in this case for example ESA’s Tenerife telescope, in trying to understand the nature and motion of the object discovered. NASA’s Center for Near-Earth Object Studies (CNEOS) was also involved, which today works within the Planetary Defense Coordination Office (PDCO) project, the agency’s NEO detection and tracing program that was opened in January 2016 to try to find possible threats to Earth in advance. Initially, the object discovered was considered a comet and therefore designated as C/2017 U1 by the Minor Planet Center (MPC) but the week after its discovery the ESO’s Very Large Telescope (VLT) was used to observe it and no trace of the come it should have at that distance from the Sun was detected. For this reason, its designation was modified into A/2017 U1 and unless there are further surprises it its classification will be as an asteroid. The high speed of A/2017 U1 with respect to the Sun, about 44 kps (27 mps), allowed astronomers to quickly get an idea of its trajectory, which seems incompatible with that of a celestial body part of the solar system. In simple words, it’s hyperbolic rather than elliptical as that of the objects orbiting the Sun. The observations suggest that it’s less than 400 meters long (less than a quarter of a mile). According to the calculations, it reached perihelion on September 9, 2017, passing about 24 million kilometers (15 million miles) from Earth on October 14. Now it’s heading towards the constellation of Pegasus returning over the ecliptic plane but it will be a really long journey. The chances that an asteroid formed in a solar system passes through another one is very low but there are so many stars in the cosmic “neighborhood” that it’s normal for such events to happen sooner or later. The possibility that in the course of the formation of a solar system various objects are ejected into interstellar space was theorized a long time ago and A/2017 U1 could be the first proof. The observations of A/2017 U1 will continue as long as possible to collect more data that might confirm that it’s a interstellar object. It’s a small asteroid but the possibility of studying an object that at the moment really seems to come from another solar system is such a new thing that all the astronomers in the world got interested.